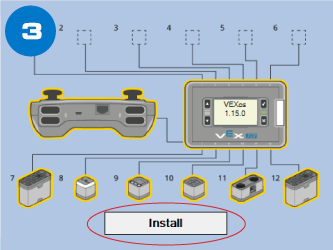 Update your VEX IQ firmware in 3 easy steps! VEXos is a robotics operating system that harnesses the flexibility and power of VEX hardware for the rigors of competition and the diverse needs of education. This operating system, written completely by VEX Robotics, uses real-time processing for repeatable operation at the fastest possible speeds. 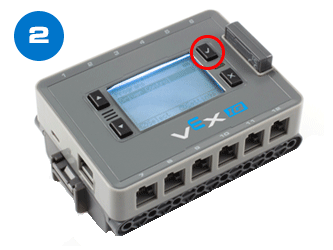 The "VEXos Utility" program simplifies updating VEX IQ hardware, and is compatible with Windows 7-10, and Mac OS X 10.10, 10.11 & 10.12. All of the VEX IQ Smart Devices (Robot Brain, Controller, Smart Motor, and sensors) contain their own internal processors and run special software. This software is what allows for advanced programming features. The best way to ensure that your VEX IQ system is functioning properly is to keep the Robot's software up to date. For information on changes between software versions, visit the VEX IQ Firmware Changelog. Note: The latest version of Modkit is required to run VEXos 2.1.2 and up. For information on changes between software versions, visit the VEX IQ Software Changelog. Note: VEXos is not available to download on mobile. Minor release to fix an issue where devices would not be detected by the brain on boot. Using the VEXos Utility Program - 3 Easy Steps! Plug all devices into the Robot Brain, and plug the Robot Brain into your computer via USB. Turn on the Robot Brain. Open the VEXos Utility Program from your computer, and click "Install". That's it! Note: If you have already installed the VEXos Utility Program, plug all sensors and motors into the Robot Brain, and proceed to step one below. B. If given the option, choose "Run". Otherwise, save the file and open it. C. Follow the on-screen instructions to install the VEXos Utility. B. Mount the DMG by opening the downloaded file and following the on-screen instructions. C. Open the DMG (found on your desktop) and drag the VEXos Utility to the Applications folder.